PHOENIX, September 12, 2008 — Award-winning playwright and performer Anna Deavere Smith will debut a new work this November exploring women’s relationships to justice and the law. The Arizona Project is a one-woman play commissioned by Bruce Ferguson, Director of Future Arts Research (F.A.R. ), a groundbreaking new artist-driven research program at Arizona State University in Phoenix. Smith is among the artists inaugurating the F.A.R. program, which launched in 2008. The Arizona Project was inspired by an ongoing series of initiatives of the advocacy group Arizona Lawyers Honoring Justice O’Connor. As in her well known previous works, Smith presents several interwoven monologues in this one-woman performance, drawing verbatim from a series of interviews she conducted over the course of three weeks in 2008. Her work honors the 2006 naming of Arizona State University’s law school for retired Supreme Court Justice Sandra Day O’Connor–the first U.S. law school to be named for a woman. The Arizona Project presents the stories of Justice O’Connor, as well as those of more than 30 women with relationships to the American judicial system, including prison system employees, incarcerated women, female lawyers, activists and others. Without identifying a specific social agenda, The Arizona Project touches upon several contemporary issues through these diverse personal stories, including immigration, domestic violence, and the challenges faced by women living on Native American reservations. The naming of the Sandra Day O’Connor College of Law at ASU honors Justice O’Connor’s career-long dedication to public service, her intellectual vigor and her sense of fair-mindedness. During the course of her career O’Connor served in all three branches of the Arizona State government, including two terms in the Senate, one as Majority Leader. In 1981 she became the first woman ever to serve on the United States Supreme Court. Her appointment by President Ronald Regan marked a profound shift in the types of professional opportunities available to women on the national stage. During her tenure, O’Connor helped define the balance of power on many of the issues of broadest concern to the nation, including abortion, affirmative action, the death penalty and religion. She retired from the Supreme Court after 24 years of service in 2005. Writer, performer and teacher Anna Deavere Smith has been a noted figure in American theater for almost two decades. Throughout the course of her career, she has earned acclaim for her investigations of American identities, as well as for her singular performance style. Through the use of social commentary and stimulation of public dialogue, Smith’s work extends beyond the traditional boundaries of the performing arts. A recipient of the 1996 MacArthur Fellowship, Smith’s best known works include Fires in the Mirror, examining the racial tension between blacks and Jews which culminated in the 1991 riots in Crown Heights, Brooklyn. She received a Drama Desk Award and a Pulitzer Prize nomination for this work. In Twilight: Los Angeles 1992, Smith examined the civil unrest which resulted from the Rodney King verdict in Los Angeles. She also received a Drama Desk award for this work, as well as two Tony Award nominations. Her most recent work, Let Me Down Easy, explores the fragility and resilience of the human body. Smith has appeared in several films, including Philadelphia and The American President, and has recurring roles on The West Wing and The Practice. She can be seen Spring 2009 in the film Rachael Getting Married with Anne Hathaway. She is also the author of two books, Talk to Me: Travels in Media and Politics (2001), and Letters to a Young Artist: Straight-up Advice on Making a Life in the Arts-For Actors, Performers, Writers, and Artists of Every Kind (2006). She is a tenured professor at the Tisch School of Arts at New York University and teaches courses on the art of listening at the NYU School of Law. She has also taught at Stanford University and the Yale School of Medicine. A groundbreaking artist-driven research program based in downtown Phoenix, F.A.R. (Future Arts Research) will host 20—24 leading national and international artists, critics and scholars each year. Working with an applied-research methodology, participants will collaborate with various departments within the university and work closely with the surrounding community to explore new concepts, test new ideas, and present the results of their research. F.A.R. is an initiative of the university president’s office, independent of the ASU’s Herberger College of the Arts. In its first phase, F.A.R. participants will focus on three areas important to Phoenix: new technologies in the arts; desert aesthetics; and issues of justice and human rights. “The Arizona Project” will be presented in three performances on November 5, 7 and 8 at the Herberger Theater in Phoenix. Ticket sales begin Sept 29, 2008. Grant Funded Position – This is not a grant funded position and is not contingent on future grant funding. J.D. or L.L.B. degree from an ABA accredited law school and six (6) years of experience in the practice of law, including experience in the primary practice area(s) designated by the Vice President and General Counsel. Must be a member in good standing with the State Bar of Arizona within twelve (12) months of hire. Experience in a diverse and complex environment working with the following: research and regulatory issues; technology licensing; export controls; intellectual property law; licensing; structuring; negotiating; drafting complex transactions and agreements relevant to a complex public research university; strong legal research abilities; effective verbal and written communication skills; advocacy and problem solving skills. The principal office is located in the ASU Fulton Center, at 300 E. University Drive, Suite 335, Tempe, Arizona. OGC maintains satellite offices at the Polytechnic, West, and Downtown Phoenix campuses. For information on admission to the state of Arizona bar, including the new registration process that is available for in-house counsel, please visit http://www.myazbar.org/ and the website for the Arizona Supreme Court http://www.supreme.state.az.us/rules/Recent_rules.htm ASU offers competitive benefits to its eligible employees including vacation time, paid holidays, sick leave, self & dependents reduced tuition, retirement, group life insurance, long-term disability coverage, medical insurance programs, flexible benefits plan and dental insurance plans. To find out more about our benefits please go to http://www.asu.edu/hr/benefits/index.html. With more than 60,000 undergraduate and graduate students across four campuses, Arizona State University is a comprehensive public research university located in one of the fastest growing metropolitan areas in the United States. ASU’s historic Tempe campus is home to research-based academic disciplines. At the West campus, ASU offers students interdisciplinary programs for broad learning experiences. At the Polytechnic campus, students approach professional and technological programs through project based learning. The Downtown Phoenix campus, the university’s newest location, is focused on programs with public purpose. Regardless of location ASU’s mission is the same; outstanding education. Attorneys within the Office of General Counsel provide services at all campuses and at multiple locations at the Tempe campus. For more information about the Office of General Counsel visit our web site at www.asu.edu/counsel. Background Check Statement – ASU conducts pre-employment screening for all positions which includes a criminal background check, verification of work history, academic credentials, licenses, and certifications. Arizona State University is a new model for American higher education, an unprecedented combination of academic excellence, entrepreneurial energy and broad access. This New American University is a single, unified institution comprising four differentiated campuses positively impacting the economic, social, cultural and environmental health of the communities it serves. Its research is inspired by real world application blurring the boundaries that traditionally separate academic disciplines. ASU serves more than 64,000 students in metropolitan Phoenix, Arizona, the nation’s fifth largest city. ASU champions intellectual and cultural diversity, and welcomes students from all fifty states and more than one hundred nations across the globe. Arizona State University is an Equal Opportunity/Affirmative Action employer. Application deadline is 11:59pm Arizona time on the day indicated. To apply, visit www.asu.edu/asujobs. Complete the required information and attach a single document, which includes: a cover letter, resume, and the names, addresses and phone numbers of three professional references. Resume should include all employment in month/year format (e.g., 6/88 to 8/94), job title, job duties and name of employer for each position. REQUESTED MATERIAL MUST BE IN ONE ATTACHMENT. Only electronic applications are accepted for this position. If you need assistance applying for this job, please contact our customer service center at 480-965-2701. ASU does not pay candidates for travel expenses associated with interviewing, unless otherwise indicated by the department at the time of call for interview. The second NABA-AZ/Student Mixer was a huge success! We had a great turnout and were able to award four book scholarships. A special thank you goes out to Vanessa Martinez, Board Member Sonia Nayeri’s sister, for making a generous donation of $1,000 to our organization. This donation was used in NABA-AZ’s first book scholarship program. Thanks to everyone for coming out to the mixer last night. We had an even bigger turnout than last year and we hope to have this event every year! Policy AnalystPublic Information OfficerStaff AttorneyIf you are interested in any of the positions, please do not hesitate to contact the Navajo Department of Personnel Management at 928 871 6330 to get more information on the job announcement. You must submit your application and resume by September 16, 2008, 5pm or open until filled. Growing up on a Navajo reservation near Gallup, N.M., Jordan Hale never dreamed he would one day be standing in front of a courtroom recommending whether a defendant should be released on bond, or working with a prosecutor to draft a criminal complaint. Becoming a lawyer was the farthest thing from the mind of the high-school runner whose home, at the end of a dirt road, had no running water or telephone. Now he is one of 37 students, representing 29 Indian tribes, who are specializing in Indian law at Arizona State University’s Sandra Day O’Connor College of Law. All but one of the students are American Indian, and they bring with them diverse traditions of such tribes as the Chippewa, Choctaw, Crow, Jicarilla Apache, and Mohawk. At law schools nationwide, interest in Indian law is growing as the economic clout and political influence of the nation’s 562 federally recognized tribes have expanded. Arizona State’s Indian Legal Program allows students who are pursuing their J.D.’s to simultaneously earn certificates in Indian law. They study the differences between the legal systems of tribes and that of the U.S. government, and many go on to represent the interests of tribes, Indian clients, or the federal government. Tribes have sovereignty rights that are spelled out in treaties with the United States, so their laws don’t always align with the government’s. That is why, for instance, Indian tribes can open casinos that would not be permitted on nontribal land. “More and more law schools are recognizing the importance of including Indian law in the curriculum because their graduates are encountering questions that require some knowledge of Indian law and sovereignty,” says Wenona T. Singel, an assistant professor of law at Michigan State University. Like many Indian law professors, Ms. Singel brings practical experience to the classroom. In addition to helping lead her law school’s Indian-law program, she serves as chief justice of her tribe, the Little Traverse Bay Bands of Odawa Indians. She says about 20 law schools nationwide report having Indian-law programs, while other experts say the number of full-fledged programs is about 12. Among the other law schools active in Indian law are those at Harvard University, Lewis and Clark College, and the Universities of Colorado, New Mexico, Washington, and Wisconsin. Learning the basics of tribal law is more than an academic exercise for many law students. A few states, including New Mexico, South Dakota, and Washington, have Indian-law topics on their bar exam that students must pass to practice law. Others, including Arizona, Idaho, Minnesota, Montana, and Oklahoma, are considering adding such a requirement. Students get hands-on training in legal clinics and clerkships like the one Mr. Hale pursued over the summer at the Gila River Indian Community, 17 miles south of Phoenix. Nationally, Indian tribes take in billions of dollars in casino revenues, which have allowed some to build state-of-the art courthouses like Gila River’s. Mr. Hale, who is entering his third year of law school at Arizona State, worked in Gila River’s criminal-law division under the supervision of April E. Olson, a 2006 graduate of the university’s Indian legal program. Ms. Olson, who is of Mexican Yaqui ancestry, is a prosecutor at Gila River. The tribe’s modern, high-tech courthouse stands out amid a flat landscape of desert scrub. A few blocks away, the prosecution office where Mr. Hale and Ms. Olson prepare their cases is a shotgun mobile unit located behind fences topped with coils of barbed wire. The casinos that have helped pay for courthouse upgrades have also spurred economic development, with shopping malls, restaurants, and service industries springing up on or near many reservations. As a result, “More big law firms are looking for people who are knowledgeable about Indian law,” said Kathlene M. Rosier, director of Arizona State’s program. Such expertise is particularly valued in a state where more than a quarter of the land is owned by one of 22 Indian tribes. Many of the legal questions that arise involve jurisdictional disputes between the tribal and federal or state governments. For instance, what happens when an outsider commits a crime on tribal land, or a company tries to repossess a car parked on a reservation? Legal standards may also differ: Environmental regulations may be stricter on tribal lands, and child-welfare laws more relaxed to accommodate traditions of caring for children in extended families. Indian reservations, many of which are located on arid lands, have battled with the federal government over water access, with dueling parties claiming the rights to the same water sources. Such issues are tackled in classes at the University of New Mexico’s Indian Law Program, one of the oldest and largest in the country. The program includes required courses, like those in Indian law and federal jurisdiction, and electives like Indian gaming, Indian water law, and state-tribal relations. Because of the shortage of American Indian lawyers, graduates specializing in the field often land high-level positions. Shortly after completing Arizona State’s program, Claudette C. White became, at age 35, the youngest chief judge ever on the Fort Yuma-Quechan Reservation, where she grew up, near the intersection of Arizona, California, and Mexico. Even after she graduated and became the tribe’s top legal authority, in 2006, she found herself turning to her professors for advice. One of them, Kevin Gover, is a former assistant secretary for Indian affairs at the U.S. Department of the Interior. (He has since become director of the Smithsonian Institution’s National Museum of the American Indian). “Sometimes I had to adjourn court to affirm that I was heading in the right direction,” Ms. White said. Mr. Gover wouldn’t just tell her the answers. Instead he would remind her about class discussions and readings and help her work through the solution. Although she was fresh out of law school, Ms. White was no stranger to tribal governance. She majored in criminal justice at Northern Arizona University before returning to the reservation. She plunged into tribal politics, becoming a court advocate and working as acting general manager of the tribe’s casino. When she was named chief judge, shortly after graduating from law school, “Some people had doubts about whether I was ready because I was so young,” she said. “But I had had a lot of personal experiences directly relevant to the cases I’m working on.” A single mother who was raising her own child in addition to the two foster children she had taken on when her own mother died, Ms. White was sensitive to child-welfare issues that came before her in court. Her struggles with her own parents’ divorce and her father’s alcohol and drug addictions gave her insight into other cases that were all too common in her courtroom. Despite aggressive recruiting by law schools, the number of American Indian lawyers remains tiny. Nationally, the number of American Indian and Alaskan Natives enrolled in J.D. programs has grown 19 percent over the last five years, to 1,216, according to the American Bar Association. Still, that is less than 1 percent of the 141,719 students who were enrolled in J.D. programs in the 2007-8 academic year. The 1,216 enrollment estimate may be too high, according to Heather Dawn Thompson, president of the National Native American Bar Association and a member of the Cheyenne River Sioux. Most law schools report enrollments based on the number of students who simply checked a “Native American” box. “A lot of students figure, ‘I was born in America – I’m a native’ and they figure that checking it will improve their chances of getting in, she says. Because of the dearth of American Indian lawyers, cases involving Indians are usually handled by lawyers who are unfamiliar with tribal laws. Nathan St. Goddard, a student at the University of Montana School of Law who worked with Mr. Hale over the summer at the Gila River reservation, believes it is important to have Indian lawyers representing the needs of Indian people. While other lawyers may come with the best intentions, they won’t have the same cultural sensitivity, he says. “People come with some idealized notion of wanting to help the Indians and save the buffalos, but they don’t know what they’re doing,” says Mr. St. Goddard, a member of the Blackfeet tribe. “What I see happening all the time is a non-Indian who has this romantic view of the ‘noble savage’ who thinks that we sit in our teepees and bang on our drums and pray to Mother Earth and cry every time we see a piece of trash on the ground.” What he sees when he returns home is a poor, dirty reservation of 1.5 million acres patrolled by a little more than a dozen tribal police officers. The tribal court, as well as the jail, is swamped. With his legal training and understanding of tribal life, he hopes to help change that, and would like to see other Indian students follow in his footsteps. 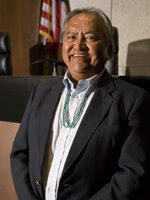 The Navajo Nation Supreme Court heard arguments on Thursday, Sept. 18, in a special hearing at the Sandra Day O’Connor College of Law at Arizona State University. The case, Ford Motor Co. v. Kayenta District Court, centered on whether tribal courts should have jurisdiction in the wrongful death case in which a Navajo Nation police officer was killed in a car accident while on duty. Dean Paul Schiff Berman thanked the Justices for holding the hearing at the College of Law and told the students they were privileged to be able to watch a court in action and ask questions afterward. The Navajo Nation Supreme Court is the first of several courts that will hold hearings at the College of Law this year. Others include the 9th U.S. Circuit Court of Appeals and the Arizona Supreme Court. Herb Yazzie, Chief Justice of the Navajo Nation Supreme Court, and a 1975 graduate of the College of Law, told students that the modern Navajo courts have evolved since the arrival of the Europeans, and continue to evolve today. “First there was the military occupation, then the treaties, then the Bureau of Indian Affairs courts, and it has evolved into the Navajo court system,” Yazzie said. He explained that each of the Navajo Nation’s 11 districts has both district and family courts, and each district has at least one trial judge, some have two. In addition, the Nation continues to use a traditional way of resolving disputes, called peacemaking, in which all parties agree to work out a solution. The peacemaking system was in place before Europeans arrived. Yazzie said the question of whether tribal courts have jurisdiction is nearly constant. “These questions are happening on a day-to-day basis, in reality, in our relationship with the U.S. government,” Yazzie said. Asked about the peacemaking system, Yazzie explained that Navajo law mandates the use of traditional law and values in the court system, and that the peacemaking system is practiced daily in cases where all the parties agree to participate. Lawyers who practice on the reservation are expected to know the law, he said. “As they say, ‘When in Rome, do as the Romans do,’ ” Yazzie said, drawing a laugh from the audience. One student asked which court would preside over a conflict between two tribes, and Yazzie said the dispute would have to be resolved between the two sovereign entities. “The bottom line in the use of courts is that you are going to someone else and asking them to make a decision for you,” Yazzie said. “Human beings ought to resolve things between themselves. The best resolution is one you make, not someone else.” Yazzie was joined by Associate Justices Eleanor Shirley and Louise G. Grant to hear the Ford Motor case. The Navajo Supreme Court helda hearing at the Sandra Day O’Connor Collegeof Law on Thursday, Sept. 18. The case involved a wrongful death claim brought by the Todecheene family. Their daughter, Esther, an officer with the Navajo Department of Public Safety, died when her Ford Expedition patrol vehicle rolled on a dirt road in the Navajo Nation. The vehicle was one of several purchased by the tribe for the department through a dealership in Gallup, N.M. Ford maintains that Todecheene was not wearing her seat belt; her parents say the vehicle was defective, and the seat belt did not work properly. However, the question at issue at Thursday’s hearing was not the wrongful death claim, but whether the Navajo courts have jurisdiction to hear the case. Ford argues that the Navajo courts lack jurisdiction. The Kayenta District Court on the Navajo Nation ruled that it did have jurisdiction. Ford took the case to federal district court, which ruled the tribal court did not have jurisdiction. The Navajo Nation appealed and the 9th U.S. Circuit Court agreed with the federal district court, then vacated its own ruling and asked Ford to take the case to the Navajo Nation Supreme Court. The 9th Circuit wanted the Navajo Nation Supreme Court to decide whether an exception applied that would give the Navajo Nation jurisdiction if the actions of a non-Indian “threatens or has some direct effect on the political integrity, the economic security, or the health or welfare of the tribe.” The Navajo Supreme Court also asked the parties to discuss whether the Treaty of 1868 with the United States allows the Navajo Nation to hear the case, and the effect of a recent U.S. Supreme Court opinion in Plains Commerce Bank v. Long Family Land & Cattle Co. Richard Derevan, attorney for Ford, argued that the only issue before the court should be the exception, and that it shouldn’t apply because an automobile accident didn’t constitute a threat to the tribe. The other issues were not argued in the earlier courts and, therefore, should not be allowed at this point in the proceedings, Derevan said. 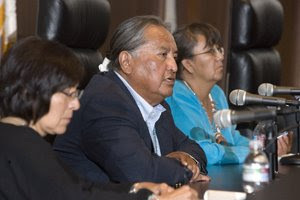 Yazzie questioned Derevan over his assertion that the death did not affect the political integrity of the Navajo Nation. “If the death of one police officer is not sufficient, then how many must die before it is?” Yazzie asked. Derevan said the case was not a case that threatened the governance of the tribe, and one that could be handled by state or federal courts. Yazzie also asked about how far the family would have to travel to file a claim if the tribal courts were not open to them. Derevan said that the tribe should ask the state and federal courts to hold proceedings closer and more convenient for tribal members. Edward Fitzhugh, attorney for the Todecheene family, said the case had followed “a long, tortured path” to the Navajo Nation Supreme Court. He argued that a police officer is an obvious government operator and that the case does fit the exception. He also argued that Ford actively promoted the sale of vehicles on the reservation, and that it had used the tribal courts for its own purpose, for example, to assist in repossession of cars, and therefore should be subject to its jurisdiction in this case. The court took the matter under advisement and will post its decision on NavajoCourts.org when it is reached. Below is a link that will take you the audio of the oral argument. George Patton (’05) is one of the conference organizers for this historic event. View the website for more details about the conference and how to get involved. The Seven Council Fires are the seven bands that make up the Lakota Dakota Nakota Oyate, known today as The Great Sioux Nation. Today members of these bands are located on reservations and reserves in South Dakota, North Dakota, Minnesota, Montana, Nebraska, Alberta, Manitoba, and Saskatchewan. The last major gathering of the Oceti Sakowin was in 1876. It was Sitting Bull that brought the people together to live the traditional way of life that had been given them by their ancestors. During this gathering of the people, George A. Custer and the 7th Cavalry attacked their peaceful camp and were quickly wiped out by men and women as they defended their homes, their children, their elders, and their way of life. Today, 130 years later we’re asking Tatanka Iyotaka to once again unite the Seven Council Fires to celebrate and defend our way of life by revitalizing our language. The Native American Law Student Association (NALSA) at the Arizona State University Sandra Day O’Connor College of Law cordially invites you to participate in its 3rd Annual Golf Tournament to be held on Saturday, November 1st, 2008. The scramble format tourney will take place at The Foothills Golf Course in Awahtukee (Phx. ), AZ. Deadline for entry is Saturday, October 18th, 2008. Players may also enter late up to the day of the event for $120 per player (subject to space availability).